Jeff and I have been wanting to eat chocolate chip cookies for a few nights in a row now and tonight the conversation went from craving these cookies we were too lazy to make (even though we had all the ingredients on hand) to wishing we could buy pie from the Bakers Square that was no longer in existence, to buying a couple apple pies from McDonalds. Jeff makes the run out to the drive-thru and comes back with this plethora of fast food. He said there was a problem — only 1 apple pie left! 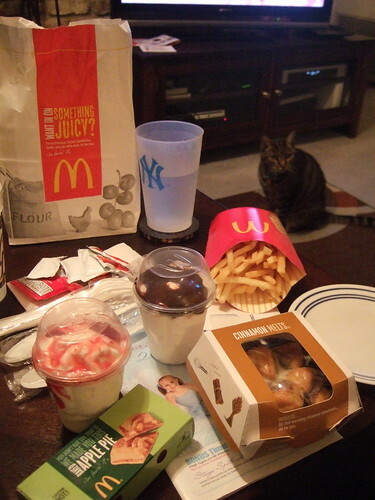 So he bought… french fries, two sundaes, cinnamelts,… oh and that last apple pie. And this is why i have to workout so much! BTW – Cinnamelts, DELISH!! !